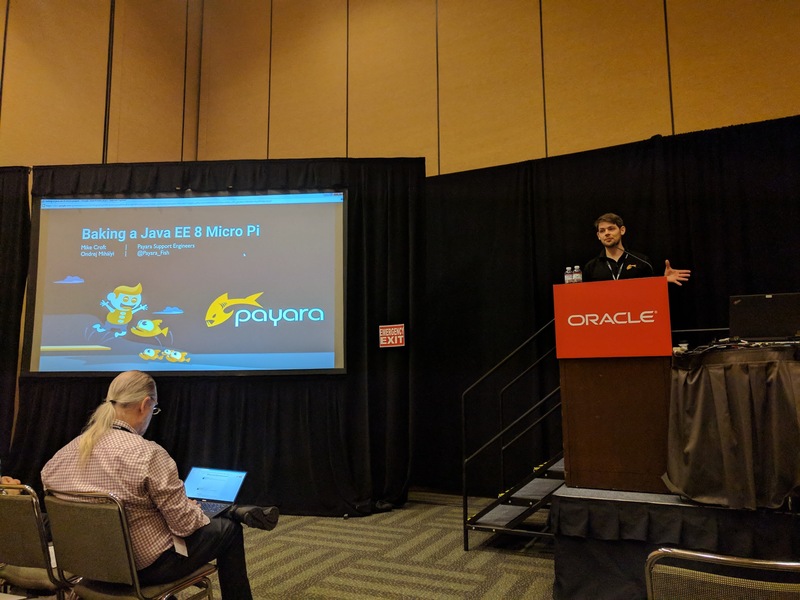 This talk by Payara guys Ondrej Mihalyi and Mike Croft debunked the myth that Java EE is heavy. Unfortunately, due to technical issues (not from the speakers), they could not do the demo. (I did go down to their booth to see it though). So we went through the code rather. The release of the specification was delayed due to a 1 year hiatus, where some of the spec leads got moved to some internal Oracle work. With the move to Eclipse (EE4J) this should not happen again. JSON Router - Kind of like XPath (but more) for Json, allowing you to manipulate (add,remove,replace) parts in a JSON document using a path-like structure. JSON Patch - A piece of Json Document itself that you can patch another document with. You can add, copy, move, remove and replace a part of a document. New API (Basically JAXB for JSON). You can also (like JAXB) write your own custom mappings. 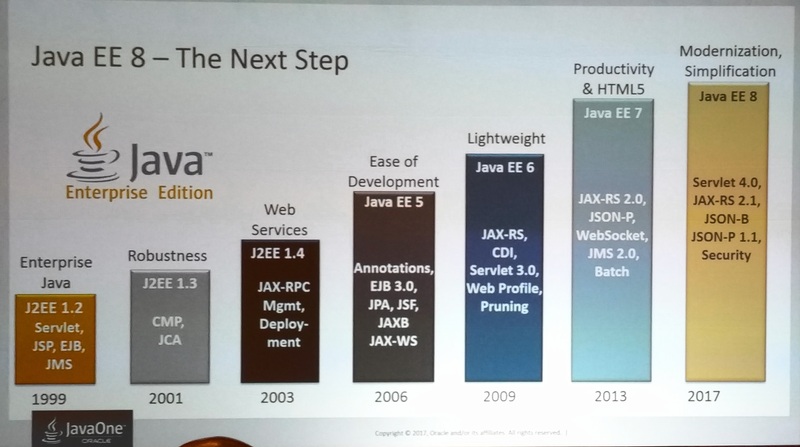 This means you can now use CDI in plain Java SE. 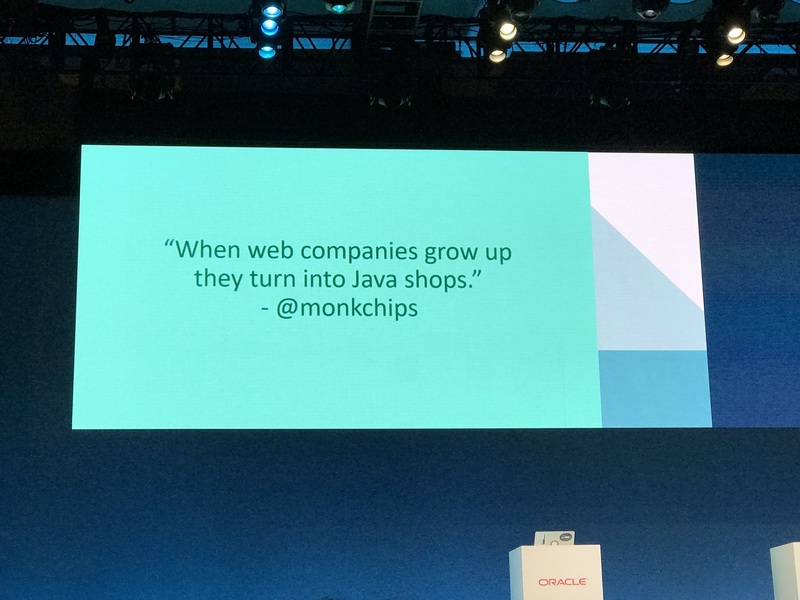 She then discussed the future of Java EE. More on that later in another talk. Servlet 4.0 Spec leads Ed Burns and Shing wai Chan went into detail on the new HTTP2 support in Servlet 4.0. You can now respond to requests in multiple resources and in parts. The same header is a full text initially, and then just an int. You can turn server push on and off. This means that when using PushBuilder you need to check for null. Another new cool feature, Mapping discovery, allows you to discover how the current servlet was reached. 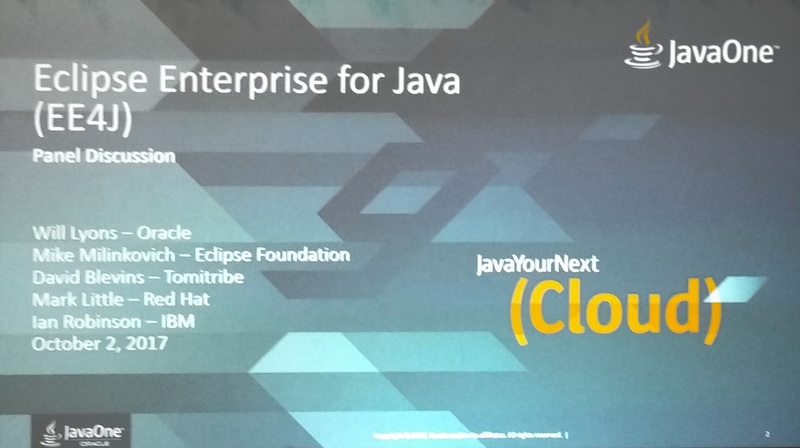 RedHat, IBM, Oracle and Tomitribe discussed the Java EE move to Eclipse. 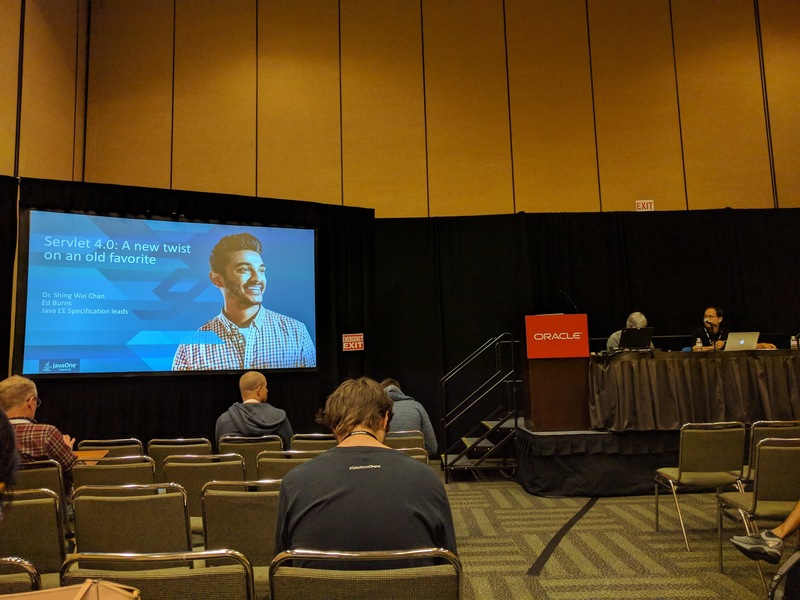 Mark Reinhold showed some features of the recently release Java 9. 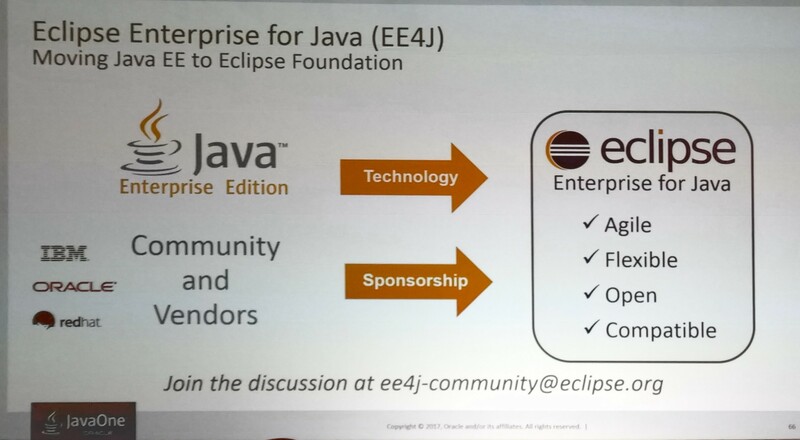 This panel discussed the recently announced open sourcing of Java EE and the move to the eclispe foundation, and the renaming to EE4J. In the future we might see Microprofile be included in this project. The goal is to make EE4J more Nimble, Agile, Flexible, Compatible and Vendor neutral. Because the TCK is now accessible to everyone, we might see more implementations. Previously the TCK was a control point (“Pay to play”). Open sourcing it changes the dynamics. “I don’t care about the name of the band, I care about the music” - David Blevins on the name change. When Should You Look at GraphQL as an Alternative to REST APIs? 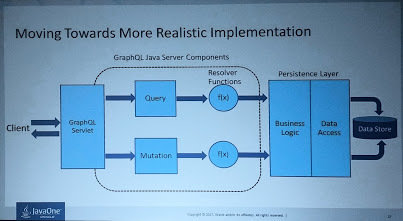 Jobinesh Purushothaman, a published author on REST, discussed GraphQL and when you might want to look at using that rather than REST. Initially we had RMI, then EJB then JAX-WS now JAX-RS. What is next ? To control the payload in REST, you typically add query parameters that allow the called to specify what it is looking for, or the client just gets everything and has to filter himself. It’s self documenting and allows the client to query only what he/she is interested in, in one call. Not more over and/or under fetching. Versioning is also not needed when using GraphQL. We need to seriously look at this ! I then went to the JCP Party on the 38th floor of the Marriott Hotel, where the winners of Duke’s choice awards and JCP Awards were announced. I also got a change to chat to many community leaders and Spec leads.